This past week I’ve been celebrating my birthday. I won’t talk about what exact age I’m marking this time around, but at least it’s given me an excuse to be treated to some delicious meals out on the town by different family members and loved ones. I’ll be reviewing two new places later this week which I’ve just enjoyed, but first up on my agenda was another return visit to one of my longtime favorites, Eastern Garden in Sussex, New Jersey. I was visiting my mother for the weekend and we always make plans to enjoy a meal at this great Japanese-Chinese restaurant when I’m in the area. 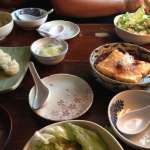 I’ve written extensively about Eastern Garden before, but never can pass up giving them a little extra praise when I get the chance as I think they’re just that good. 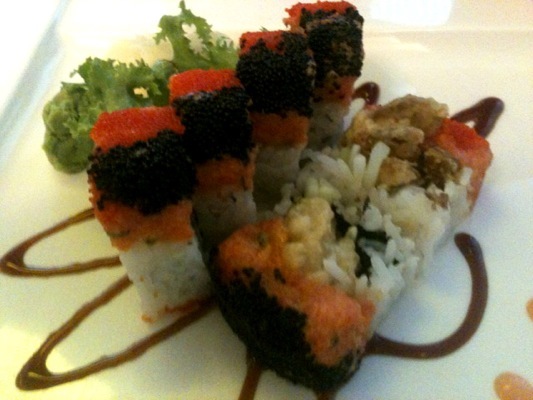 This time around we primarily enjoyed a few old favorites off their menu, but we did try one new special maki roll, the “Spider Man.” This twist on a traditional Spider Roll was simply wonderful, not just in appearance (love the red and black fish roe to give it that Spider Man look!) but in flavor. The soft shell crab was perfect – fresh tasting, nicely batter fried and substantial in amount. 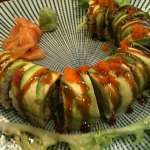 Set off with cucumber, avocado, and just a touch of spicy sauce, nothing overpowered the flavor of the crab, only accenting it with a delicious combination of crunchy, salty and spicy flavors. I really hope this becomes a regular roll on their menu whenever soft shells are available – it was truly one of the best rolls I’ve ever had the pleasure to enjoy. 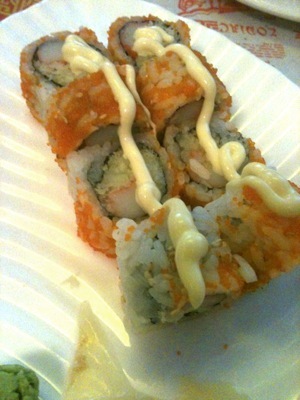 At $11.99 for the roll it was quite reasonably priced as well, as are all of the specialty rolls at Eastern Garden. 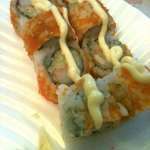 We also had an older, simpler favorite, the Crunchy Roll with crabstick, tempura “crunchies”, roe and spicy mayo. Comforting and tasty as always. For entrees, we had the Beef Chow Fun, loaded with fresh and crisp-tender vegetables, and their delightfully artistic and fresh Chirashi as well. Somehow there was nothing left to take home at the end of the meal – I don’t know how we ate all that food. 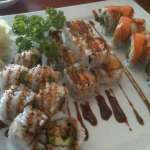 The bill was all of $45 for two great specialty rolls, a sushi entree and a very generous noodle dish. 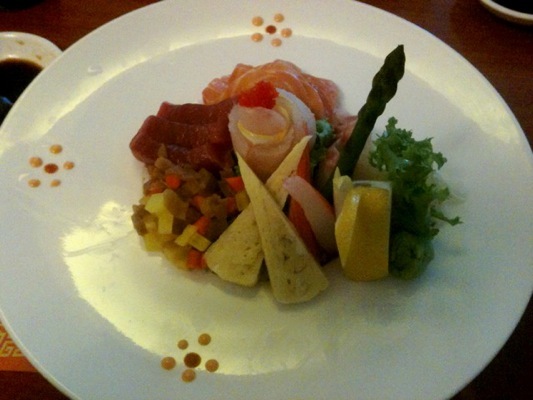 We enjoyed the meal with a bottle of Casas Patronales Sauvignon Blanc, one of my favorites for pairing with sushi and just lovely on a warm Spring day, and under $9 at the nearby Patrick’s Wine Barn. 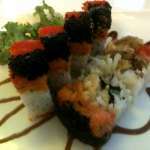 As always, the service at Eastern Garden was top notch, and we gave special thanks to the sushi chef for that delightful new creation of his, the Spider Man roll. Do check it out if you get the chance. 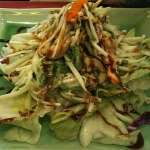 Eastern Garden now has a Facebook Fan Page where you can get announcements about new specials and also check out their full menu. Next up on my review list are two places I’ll be looking at in detail: Philadelphia’s La Veranda, and Mullica Hill’s blueplate. 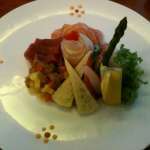 This entry was posted in General restaurant reviews and tagged eastern garden, japanese food, new jersey, restaurant review, sushi, sussex. Bookmark the permalink.